Looking to get more out of your Infor CRM and working smarter? Over the years I have seen what the most productive sales people do when using Infor CRM (formally Saleslogix). The following series of articles will cover 12 tips that help to build a relationship faster and connect intelligently with both prospects and customers when using Infor CRM. This series of articles will mostly apply to the Infor CRM 8.x web client. Today's article is setting the default one time options to speed up working inside Infor CRM. While this may be boring, you only need to set these options once and the time and frustration saved will be worth it. Set up your default options to work the way you want to work. Do it once to make life easier thereafter. Under the top menu bar, select "Tools->Options". Under the General tab, "General Options" section select what you want to "Show on Startup:" Typically this will be Opportunities, Contacts or if you are into metrics, a Sales Dashboard. If you want to view your Activities main view first then select "Activities" option. Next setup the "Default Owner/Team" to be either Everyone (if your company shares all account) or the specific sales team you will be adding new accounts to. If you get logged off before the 30 minutes of inactivity then change the "Log off after" setting. Always leave the "Prompt for unsaved data" checked. Use the Accessibility option "Display List view check boxes" to allow you to check off one or more records shown in a list box when you view groups of contacts, opportunities, accounts, etc. This is a great visual clue of who you select to process a group of records. 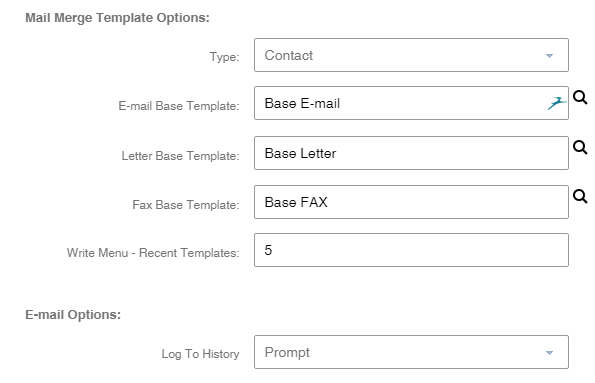 To the right side on the General tab are Mail Merge options to define the various templates for a contact or lead for email, letter and fax. Use the "E-Mail Options, Log to History" to either Prompt or not prompt you after sending an email using the Outlook Send to CRM button: . In the "Log to History" box, select "Prompt" if you want the "Complete E-mail" dialog box to display after you drag and drop an email-message. If you want the message to be recorded to history without prompting select "Do Not Prompt". You also need to set options for Send to CRM and Record to History in Outlook. The prompting comes in helpful for a CPA client who will additionally link a service request ticket or sales opportunity to the email history record. In the bottom right corner is a option to "Install CRM Enhancements" for CRM Desktop integration with Outlook This provides support for Send to CRM and Record to History in Outlook, synchronization of contacts and activities, drag & drop attachments/mail merge with IE browser. Review the ? help icon or here for more information. If you have Outlook Integration enabled you next select which contacts sync from a contact group in Infor CRM with the Outlook contact folder. Group tab allows you set setup which you what to see for the 15+ main entities. Primarily a sales person will setup the default group and default lookup group for Account, Contact & Opportunities. The following setting means that when you switch to view accounts the group "My Accounts" will first be shown. If you do a search to lookup an account then the results will be shown with the columns from the "All accounts" group. The "My..." groups are helpful to use because they are a subset of all records for the group and the My means you are the account manager. Now if you do most of your work with contacts you might select a Default group that best applies to people you deal with the most. Also I have setup my Default Lookup Layout group to "My custom contacts" because that group lists the last name and first name as separate columns first - which is the main way I look a contact name. The help the display of group records with lots of columns check the option "Auto-fix Columns" and you'll see all the information without horizontal scrolling. Activities Tab is used to manage how you work with activities. Typically the Default view is set to "My Activities" but selecting "All Open " or "Past due" may be more appropriate for you. Ideally would setup a default follow up activity like Phone call, To-do or meeting. It works best to set "Carry over Notes" and Attachments to "Yes" for consistently in a set of messages. - Select Show history for all participants if you want history record for all activity participants to display in the default views Notes/History tab. - Clear Show history for all Participants if you want history records for only the primary participant to display in the detail views History/History tab. The bottom section allows various configurations for the 4 meeting types. 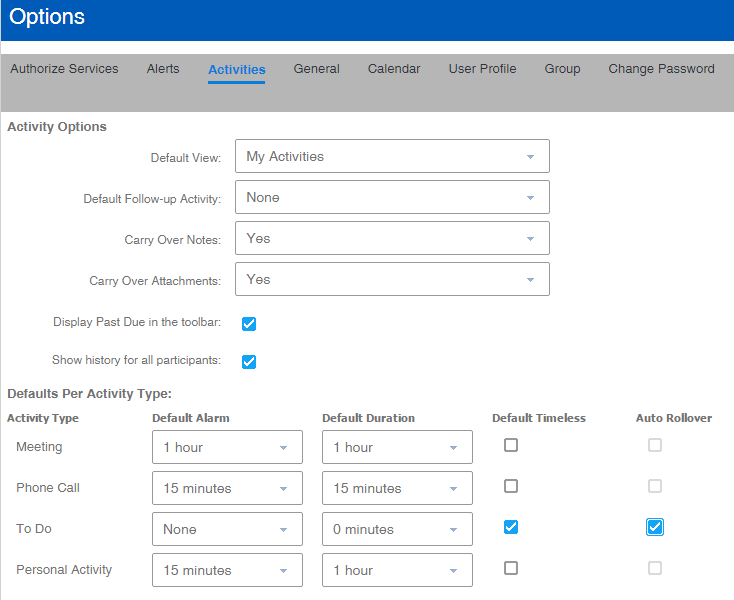 If you select the "Default Timeless" option and you want activities to automatically roll over to the next day if they are not completed on the schedule date, then select the "Auto Rollover" option. 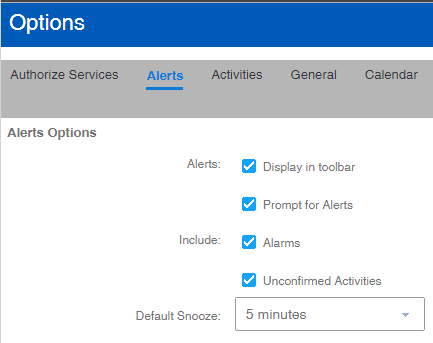 Alerts Tab relates to the schedule activities and how you want the pop up alerts to work. 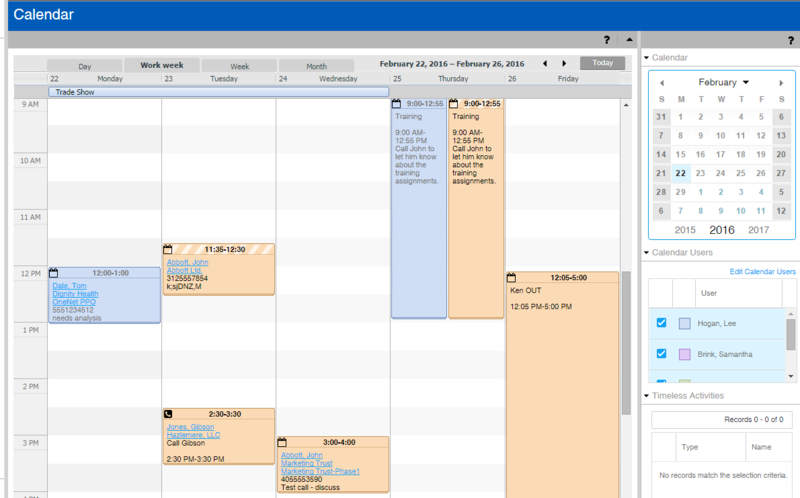 Calendar tab allows for the configuration of your Calendar Main view. Calendar options allow you to adjust the content and appearance of your calendar to accommodate the way you work. You can set the type of information that displays in activities, the start and end of the work day, the default calendar view, default interval on the calendar, and whether or not completed activities (history) items display. (History items only display on the day and week calendars by default). If you always view a set of additional users at the same time, in the "Remember Selected Users", click the drop down arrow and select Yes if you display multiple users on your calendar view and want to save the list of users between sessions. Opportunities tab is used to specify default settings for any new opportunities that you enter in the Infor CRM web client. These options only apply when the current user is signed in to the Infor CRM web client. Unless you have a specific naming convention leave "Use default naming convention.." checked. Next the default opportunity status, type and starting percentage of probability. Select the default number of months after opening that you expect the opportunity to close and optionally select if you want that the last name of the month.... most sales reps check this box. I'd recommend that some structured sales process be defined and you can select which one to used. Sales processes are setup originally by the system Administrator. Finally if you are dealing with several people at an account for the sales opportunity select "Add all contacts associated with account", but typically I will see most sales reps select "Add only the account's primary contact." Change password tab is used to set a new password. After making a change always press the Save disk icon on the tab's top right hand corner. And the ? help icon is your friend, use it freely to get help on the various options at any time. Infor CRM provides tools to allow you to modify some parts of the interface so that you can work in the way that suits you best. 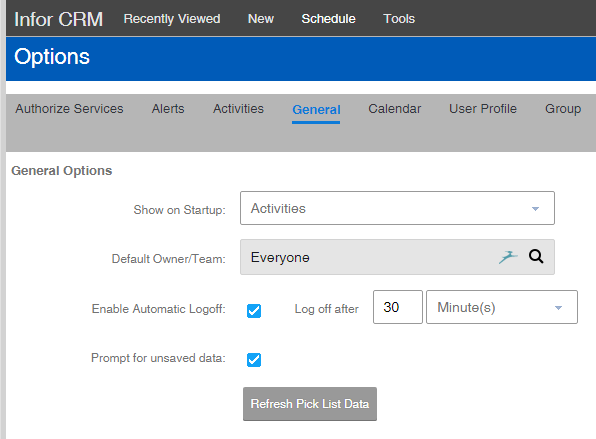 User Options allow you to set specific preferences for such features as the view that appears when you start the Infor CRM Web Client and Alerts. Your settings that you enter are recorded for you and are not visible to other Infor CRM users. Some options are shared between the Infor CRM Client and Infor CRM Web Client. 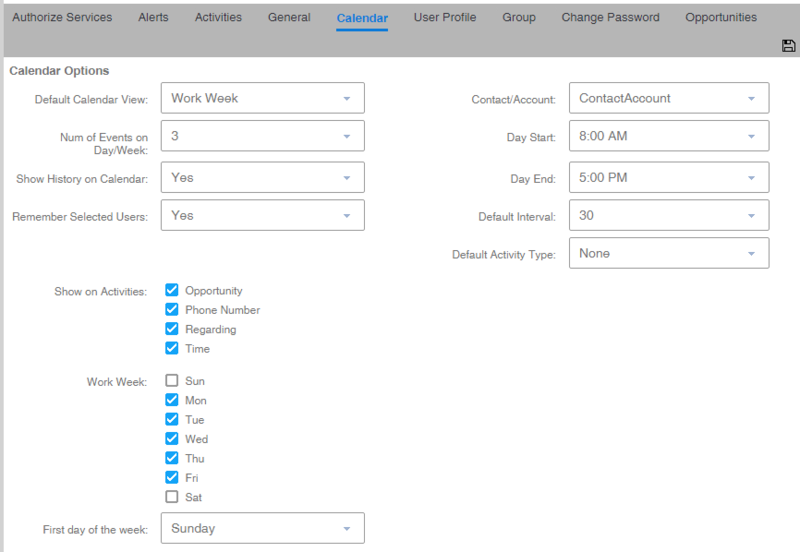 Use the above options to make your daily life easier with Infor CRM. and get these configured for you.